Master of the Game is an amazing poker prediction which can be performed totally impromptu, with a spectator shuffled deck and with essentially no sleight-of-hand unless you consider crimping a card sleight-of-hand. Imagine the following. A spectator shuffles an ordinary deck, perhaps his own. The performer tells of a strange dream in which he and the spectator played a simple game of cards. Furthermore, the performer has set down the details of the dream on a slip of paper which is sealed inside and envelope. The envelope is placed on the table where it remains for the rest of the routine. The spectator and performer now cut the deck, selecting five cards each to build up a poker hand. The hands are played and it is seen that the performer has won. Not only that but when the envelope is opened, the note inside predicts the performer's winning hand. Remember, the performer works with a shuffled deck. He does not add any cards or change the positions of them in any way, yet he still manages to cut himself a winning hand. This ebook explains the system in detail, provides two different routines and many suggestions for variations. 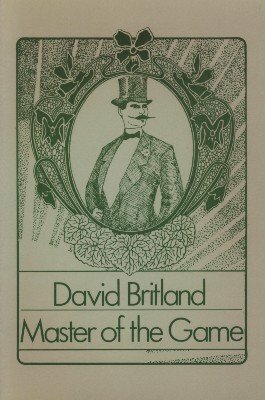 Master of the Game may become one of your favorite gambling demonstrations. 1st edition 1988; 16 pages.